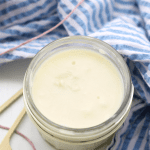 DIY Natural Deodorant…That Actually Works! As water is heating up, ensure to stir coconut oil and shea butter and continue to do so until it melts. Place in a 3 ounce jar and allow to cool at room temp or in fridge (will harden faster in fridge) until it’s reached a solid state. For a regular day, one application in the morning should be fine. For hotter days, workouts or if you’re particularly sweaty, feel free to reapply as needed. *Certain people are sensitive to tea tree oil so be sure to test your skin with a drop before adding to mixture. It is not necessary to include but tea tree is antibacterial and it is the bacteria in your underarms that leads to smell so it is a nice addition if you are not sensitive.